The special blend of materials—which could also prove useful in semiconductor components—eliminates the need for a process known as doping that steers the device's properties by introducing foreign atoms to its electrical contacts. This doping process adds complexity to the device and can degrade its performance. "The solar cell industry is driven by the need to reduce costs and increase performance," said James Bullock, the lead author of the study, published this week in Nature Energy. Bullock participated in the study as a visiting researcher at the U.S. Department of Energy's Lawrence Berkeley National Laboratory (Berkeley Lab) and UC Berkeley. "If you look at the architecture of the solar cell we made, it is very simple," said Bullock, of Australian National University (ANU). "That simplicity can translate to reduced cost." 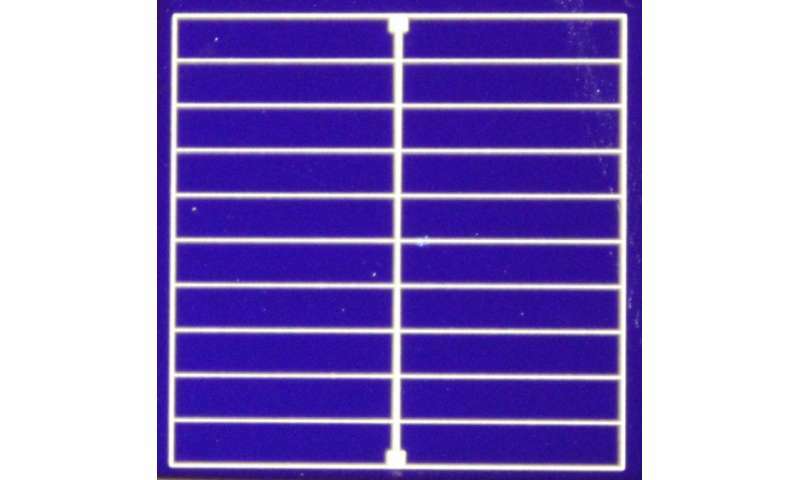 Bullock added, "Conventional silicon solar cells use a process called impurity doping, which does bring about a number of limitations that are making further progress increasingly difficult." Most of today's solar cells use crystalline silicon wafers. The wafer itself, and sometimes the layers deposited on the wafer, are doped with atoms that either have electrons to spare when they bond with silicon atoms, or alternatively generate electron deficiencies, or "holes." In both cases, this doping enhances electrical conductivity. In these devices, two types of dopant atoms are required at the solar cell's electrical contacts to regulate how the electrons and holes travel in a solar cell so that sunlight is efficiently converted to electrical current that flows out of the cell. Crystalline silicon-based solar cells with doped contacts can exceed 20 percent efficiency—meaning more than 20 percent of the sun's energy is converted to electricity. A dopant-free silicon cell had not previously exceeded 14 percent efficiency. The new study, though, demonstrated a dopant-free silicon cell, referred to as a DASH cell (dopant free asymmetric heterocontact), with an average efficiency above 19 percent. This increased efficiency is a product of the new materials and a simple coating process for layers on the top and bottom of the device. 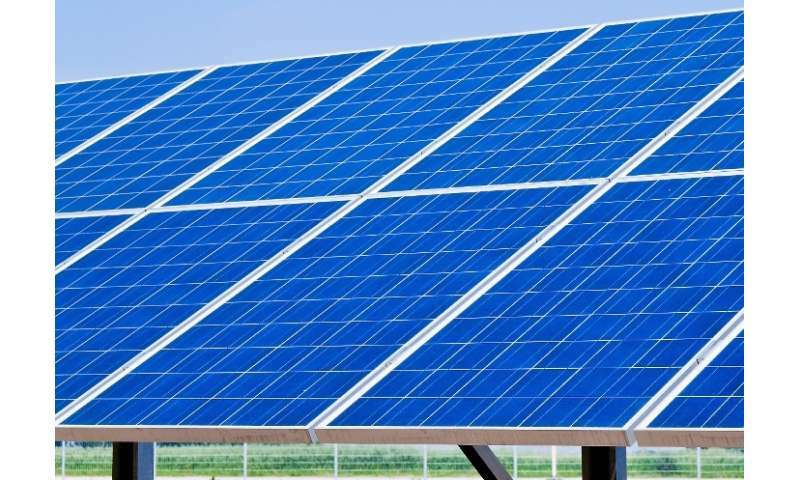 Researchers showed it's possible to create their solar cell in just seven steps. "Moly oxide and lithium fluoride have properties that make them ideal for dopant-free electrical contacts," said Ali Javey, program leader of Electronic Materials at Berkeley Lab and a professor of Electrical Engineering and Computer Sciences at UC Berkeley. 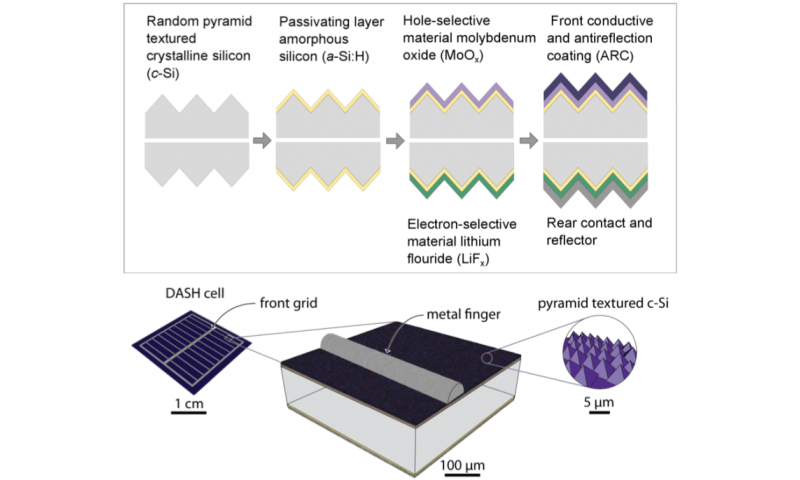 "They were previously explored for other types of devices, but they were not carefully explored by the crystalline silicon solar cell community," said Javey, the lead senior author of the study. Javey noted that his group had discovered the utility of moly oxide as an efficient hole contact for crystalline silicon solar cells a couple of years ago. "It has a lot of defects, and these defects are critical and important for the arising properties. These are good defects," he said. Stefaan de Wolf, another author who is team leader for crystalline silicon research at EPFL in Neuchâtel, Switzerland, said, "We have adapted the technology in our solar cell manufacturing platform at EPFL and found out that these moly oxide layers work extremely well when optimized and used in combination with thin amorphous layer of silicon on crystalline wafers. They allow amazing variations of our standard approach." The team used a room-temperature technique called thermal evaporation to deposit the layers of lithium fluoride and moly oxide for the new solar cell. There are many other materials that the research teams hopes to test to see if they can improve the cell's efficiency. Javey said there is also promise for adapting the material mix used in the solar cell study to improve the performance of semiconductor transistors. "There's a critical need to reduce the contact resistance in transistors so we're trying to see if this can help."